As companies big and small compete for business across town and around the world, they are also competing to attract, retain, develop, and engage their employees to help drive ongoing success. The urgency to modernize how these activities are managed is driving an urgency to adopt innovative HR technologies. The challenge arises when HR leaders are asked to define the value and ROI of these improvements. 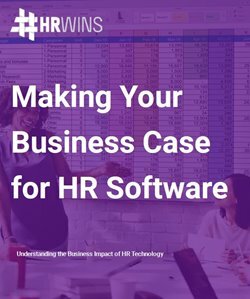 This white paper will help readers understand the true business impact of HR technology – both quantitatively and qualitatively – and then build the case for making these critical investments. What is your timeframe for buying payroll/HR services? Paychex, Inc. (NASDAQ: PAYX) is a leading provider of integrated human capital management solutions for payroll, human resources, retirement, and insurance services. By combining its innovative software-as-a-service technology and mobility platform with dedicated, personal service, Paychex empowers small- and medium-sized business owners to focus on the growth and management of their business. Backed by more than 45 years of industry expertise, Paychex serves over 650,000 payroll clients as of May 31, 2018, across more than 100 locations in the U.S. and Europe, and pays one out of every 12 American private sector employees. Learn more at https://www.paychex.com.